What ever happened to "Let's Roll"
On 9/11, the passengers aboard United Flight 93 had an option – they could rely on the good intentions of their captors or they could fight back. When presented with this Hobson’s choice, they responded with the words “Let’s roll.” Their ensuing actions were the very definition of heroism. What a strange and dismal trip it has been for the Western world, going from “Let’s Roll” to “Fighting Back Was Not An Option” in scarcely more than five years. One can only hope that when the history of our era is written, the former will turn out to be the immortal quote, not the latter. IT MAY SEEM EASY AND UNSEEMLY FOR A KEYBOARD WARRIOR like me to criticize the conduct of the British troops. Perhaps it is too easy; I have never been in a situation comparable to the one these men (and woman) were in. I can’t say with any confidence how I would respond. But I can say with some confidence how I would hope to respond; I hope my response would be nothing like that of the British seamen. And I’d like to think my life experience has helped me arrive at this worldview. A half-decade of serious illness has forced me to accustom myself to looking death squarely in the eye on an ongoing basis. At some point, you come to a realization that death is inevitable. And you also come to appreciate that there are things worse than death. Just as there are things worth living for, there are things worth dying for. One’s own honor and especially the honor of one’s country must be among those things if you don the uniform of your country’s military. In spite of the foregoing, I understand and acknowledge that my résumé for discussing such matters is slight. But MSNBC military analyst Jack Jacobs’ is not. I had the pleasure of meeting Captain Jacobs for a few minutes about a year ago. He’s a small man, and you don’t look at him and instantly think “war hero.” It’s precisely for this reason that his valor is so poignant. For a nation to be great and its military to be great, it needs ordinary men to do extraordinary things. It also needs ordinary men who are willing to make extraordinary sacrifices. Jack Jacobs watched the English press conference where the soldiers’ Captain declared that “fighting back was simply not an option.” Like me, Jacobs was horrified. Because of his military experience, Jacobs was personally outraged as well. 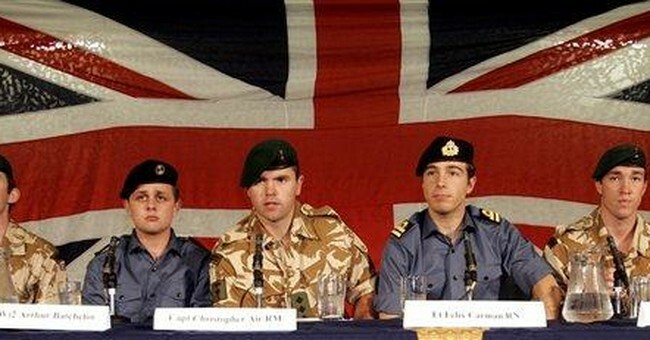 To some, the returning British soldiers may be heroes. If we have so defined heroism down, woe be unto us all.